Last weekend I created the most magical wedding cake for Marina de Jong's wedding at Ashley Manor. 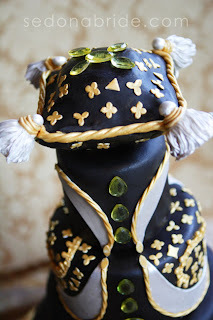 Marina is a Pastry Chef herself and had definite, over-the-top ideas for her cake when she sought me out. 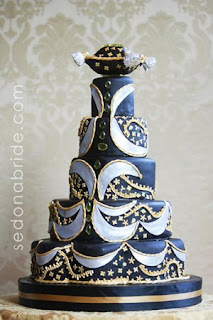 The cake had sugar crystal gemstones, sugar tassels and lots of braid detail. The color palette of black, gold and silver worked incredibly well together. To see this cake set up in that spectacular room at Ashley manor was breathtaking! I had the honor of having a world-class photographer shoot this cake for me - thank you Katrina Wallace of sedonabride.com for coming to my cake studio and creating these beautiful photos in your ninth month of pregnancy! (It's a girl, and we're hoping her name will be Francesca but it looks more like Caroline)!!!! What a fabulous cake, and what a lucky bride to get one of your beautiful cakes I'm so proud to have such a talented Daughter in law.